He is a Skill Drills volunteer who has consistently shown up on Saturdays throughout the session. I knew I wanted to interview him for our newsletter when he told me one weekend that he valued volunteering at Skill Drills a whole lot more than simply sleeping in. He felt like his weekends were more productive and positive when he began it with Skill Drills. I could relate. Eddie grew up in the inner city of Boston. For that reason he feels the most comfortable volunteering with urban youth. Despite his experiences lending hands in other ways, he has always felt at home surrounded by the chaos of children. Because Eddie has attended all of the Skill Drills this session, he has really been able to see kids progress from week to week. He told me about Enis, a boy in the first and second grade group, whom Eddie has stuck with and has seen transform through the weeks. Enis used to not follow directions and go against whatever activity was being played. Now he stands in line, follows along with activities and is really opening up to Eddie and other adult volunteers. Enis now actively looks for guidance from the volunteers and cooperates with the other kids. Eddie believes that with kids, it’s all about consistency, consistency, consistency. 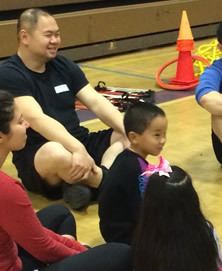 He is a consistently finding ways to bring a smile, laugh, or grin to kids’ faces at Skill Drills each week. We appreciate his dedication to the program and his warm-hearted spirit with the kids.